We have been putting the new Listerine Smart Rinse to the test, after all, September was National Oral Health Month. Dental health may not be most exciting topic, but it’s one of the most important ones that we often overlook as Moms. Motivating our children to adopt good dental habits isn’t easy but a mouth wash with kid-friendly flavours goes a long way in nudging them and making the experience much more exciting. 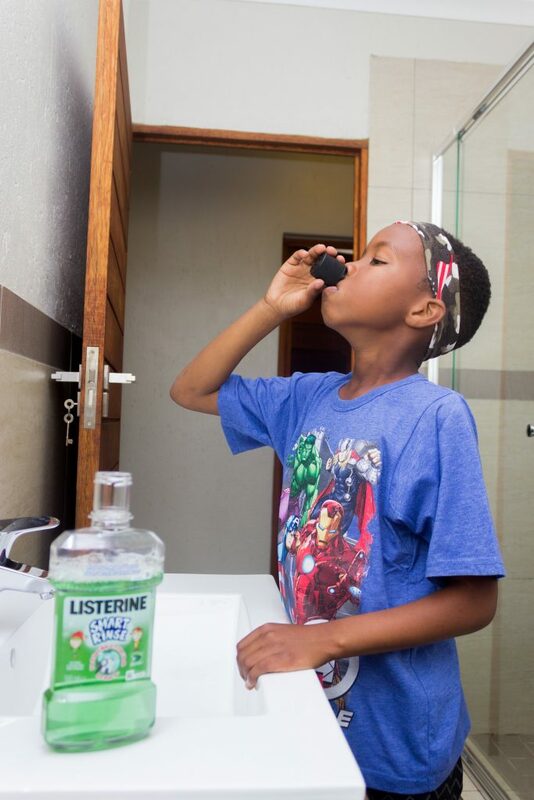 I can still remember how fascinated Lesedi was with the ‘blue water’ I used after brushing my teeth when he was a toddler and now there’s a special range available just for him. 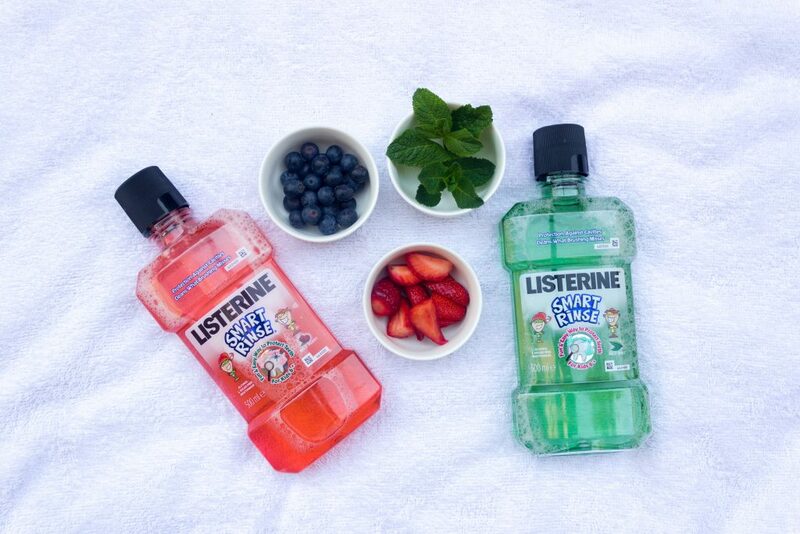 The new Smart Rinse range comes in two variants – mild berry and mild mint. His favourite is the mint and having tried them myself, I’m a mild berry fan. Using a mouthwash after brushing is an essential part of maintaining clean teeth, fresh breath and healthy gums, while preventing tooth decay. Listerine Smart Rinse has just the right amount of fluoride for your child’s young teeth that can help prevent cavities. Supervise brushing until they know how to brush properly. Proper brushing includes cleaning their teeth, tongue, gums and the roof of their mouth. 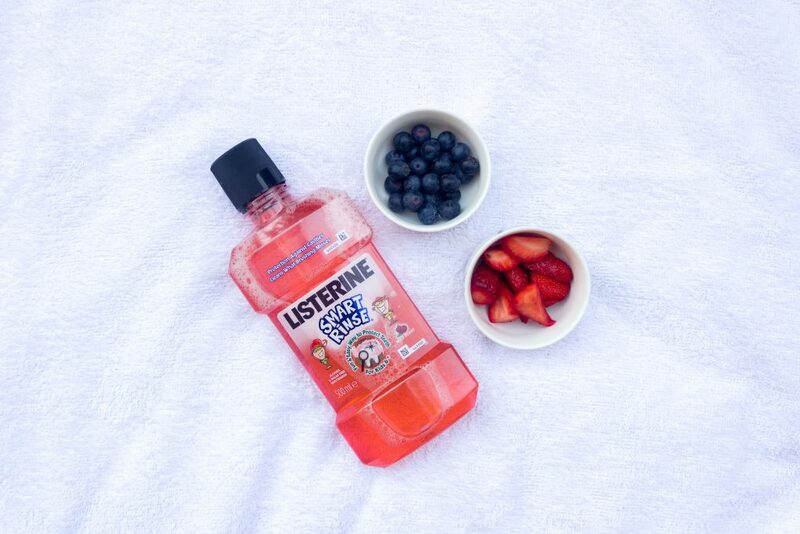 Complete every wash by using an alcohol-free mouthwash, which will ensure that they clean what brushing misses. To do this, swish 10ml, twice daily after brushing for 60 seconds then spit out. Encourage and help them to brush their teeth twice a day – the evenings are less rushed so you can make this a fun part of your evening routine. Healthier eating will also lead to healthier teeth – limit fizzy drinks. Teach your child how to gently floss their teeth. How do I know this little guy loves the smart rise?? I haven’t had to remind him to do any brushing and rinsing! 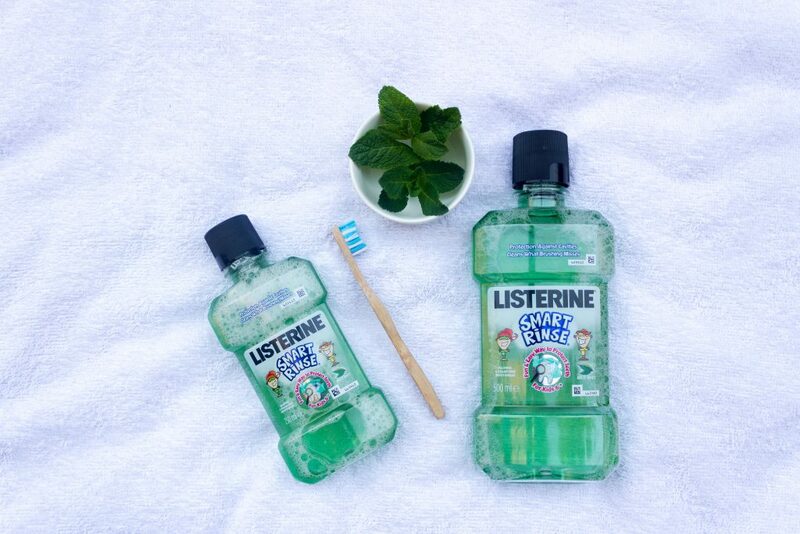 I’m so pleased to be giving three lucky families a chance to win a LISTERINE SMART RINSE hamper! To enter, simply leave me a comment telling me why you would make this smart choice for your kids. 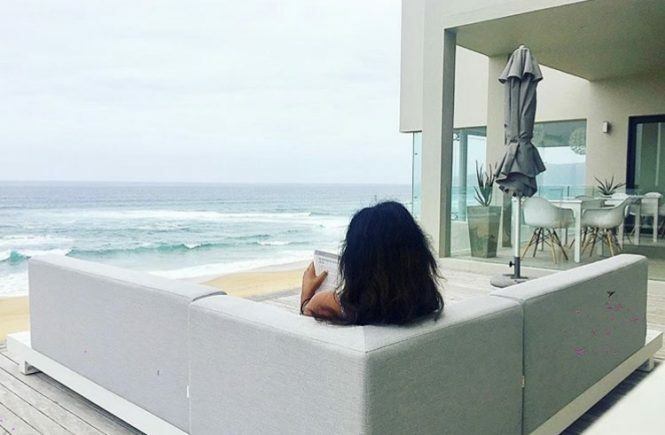 Full T’s and C’s apply – view them here. Giveaway will close on Friday 12 October. Best of luck and happy rinsing! I would make this smart choice because I want continue to educate by son about the importance of oral hygiene so he can continue this tradition with his kids as well. But also to make it a tasty and fun experience for him. Thank you for sharing another wonderful competition. I would love to win this for my family . I have two daughters aged q14 and 7 . I would love to introduce more ways for them to look after there teeth mouth and gums . This will be a confidence boost for my eldest as she is always worries about bad breath . I have 3 sons and nagging them endlessly about dental hygiene is exhausting. I’d love to give them something new and fun to experience and hopefully get them more invested in their dental health! I got 2 little rascals aged 5 and 3 that really love to brush their teeth everyday, and this will be great as I haven’t introduced mouth wash yet. I will most certainly make this a smart choice as it will make dental health care fun it will encourage and motivate them to take care of their oral hygiene. The bright colours and flavour will entice them no more nagging them…. This is so exciting and love to win and can’t wait to see reactions after using this products. Thank you for a interesting and enlightening post. I would make this smart choice because their teeth are for life and if well cared for they can avoid all the traumatic dental procedures one has to go through if the teeth are not taken care of. 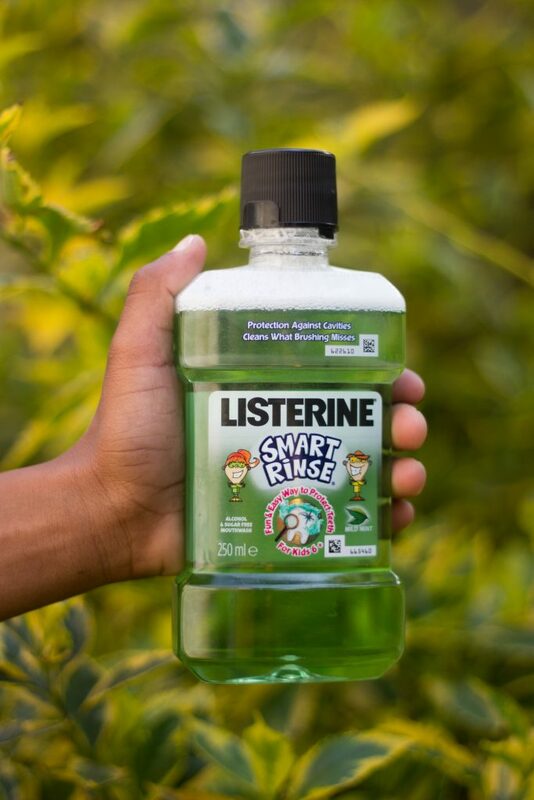 My 8 year old son just lost his front teeth and with me having to remind him all the time to brush his teeth, the Listerine Smart Rinse would definitely be a cool addition to the dental care routine. And with my 20 month daughter imitating everything her brother does, it will make things much easier when she can use the Smart Rinse as well. I’d make this smart choice for my boys because as they are getting bigger and becoming more independent they are wanting my help less often especially when it comes to brushing. A good mouthwash would ensure that any spots they have missed would still be germ free. A smart choice for sure with three kids its a nightmare encouraging dental care this will certainly help me to stress less as this will be super fun to use. No more yelling at three of them as they can use it with ease and have a healthy mouth teeth and gums. Because your mouth and teeth are all very important in making a lasting first impression. Smart of them to include a range specially for kids. This will ensure that my boys will maintain healthy gums and help prevent tooth decay. It’s a bonus that its sugarfree too. When we’re running late in the morning for school I’m always worried if they brushed their teeth properly. I will definitely make this smart choice for my 3 boys. 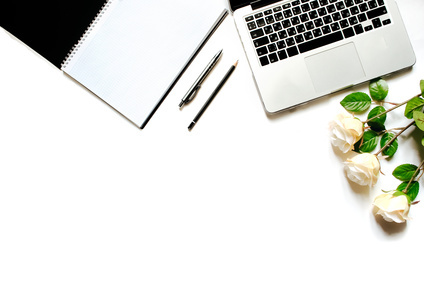 Thanks for reviewing this product and introducing it on your blog. My son loves to gargle water, so this would definitely be a hit. i have 2 girls aged 3 and 7 and using this would help them maintain clean teeth, fresh breath and healthy gums, while preventing tooth decay. It’s helps the teeth to be clean, its give them fresh breath and helps with tooth decay. It is important to educate children from a young age about oral health. Also to take them to the dentist every 6 months for a routine clean and check so that taking care of their teeth becomes a priority. I will luv to teach my daughter how to take care of her teeth. And to make good choices.m teaching her from a young age, ia the best. She will grow up doing the right thing and using Listerine throughout her life. 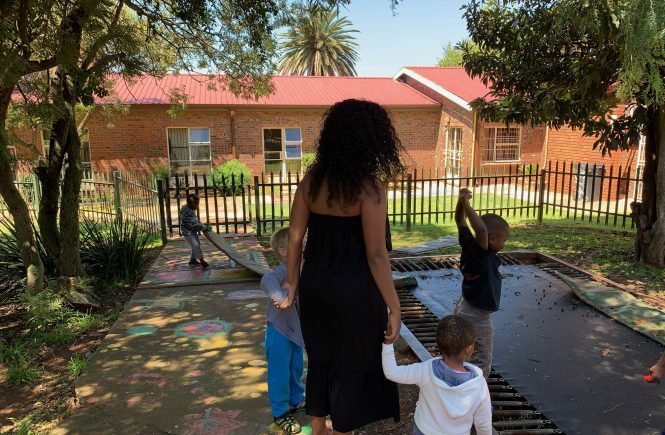 With 4 kidsto care for, I need to ensure each other is given time and care to grow in a healthy way. Recently one of them has had to have teeth removed and this made me extra vigilant in oral hygiene. I was also feeling so terrible as a parent, feeling like I let her down & could have done better for her. The last mouth wash I bought was just to burning, they all ran for their lives! A smart choice for my kids oral health, clean , healthy, fresh smelling teeth gives confidence for a bright beautiful smile!